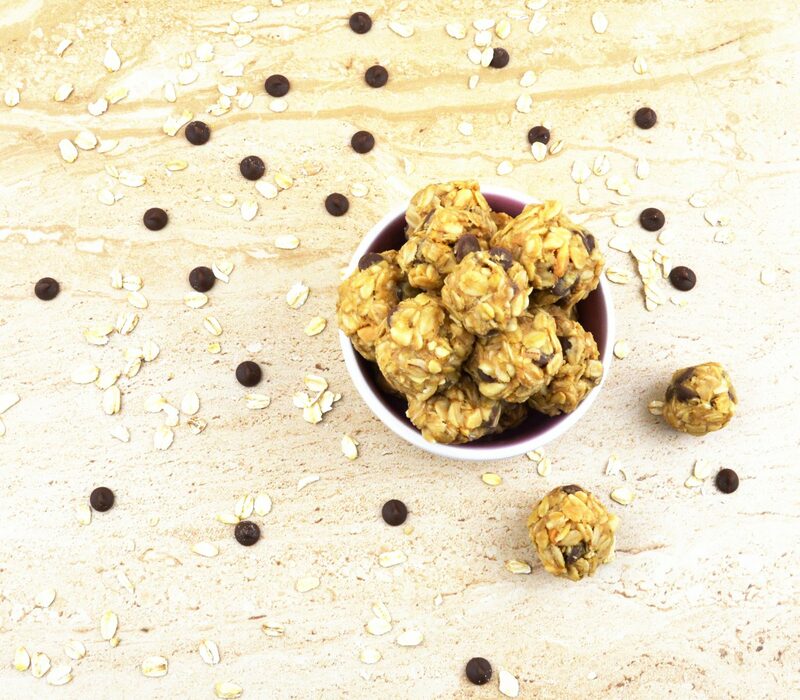 Oatmeal energy balls are quick, simple, make ahead snack perfect as after-school treat. KIDS CHEF JUNIOR – My little chef’s first cookbook review. I am the lucky ones to get pre- lauch copy of the” Kids Chef Junior” cookbook. Being a strong advocate and an avid reader of the kids cookbooks, I was pleasantly surprised when I came across the book ‘Kid Chef Junior’ written by Anjali Shah. The author, a mother of two and a nutritionist herself has wisely chosen a diverse and well written recipe structure. I always believed that kids cookbooks should be captivating and easily digestible by its users and this book has certainly done that. The book is well articulated right from the cover itself and definitely gives a great start off point. The recipes are coherent and are tailored for the needs of kids. The visual finesse is well presented and gives an aesthetic feel to the book. The visuals are aimed towards attracting kids and doing stuff their way. Her attention to detail and the flow of the book is commendable. The names of the recipes are catchy and attracts kid’s right from the first one. The book starts by giving the grownups and kids separate instructions on safety and the safety measurements that have to be taken. The cooking equipment is pictorially depicted with attractive symbols for the kids. One of the speciality of this book is author assumes that the reader knows very little about cooking with kids and gives a detailed explanation on every step of the cooking process. The names of the recipe are coined in a kid friendly and framed in a very attractive way. Each recipe also has a joke related to the recipe. The recipes are easy to follow and colourful. They have provided the option to make their own variation of the recipe. Kids are in for a surprise at the end of the book with food related doodles. This books gives a great impetus for parents to teach cooking for their cook in a safe and healthy way. My daughter, Samyuktha (Samyu) a true little chef and a trusty kitchen helper, was very excited to make her own dish. Samyu went through the cookbook first, while flipping through the pages she first decided to try her favourite pancake titled ” Bunny Pancakes” in the breakfast section, instructed me to note it down and continued to scan the book. On reaching the desserts section, little chef decided to try no bake “Cookie Bites”, as she love cookies. Pancake and Cookies both being her favourite, it took couple of days for her to decide which dish to try first. 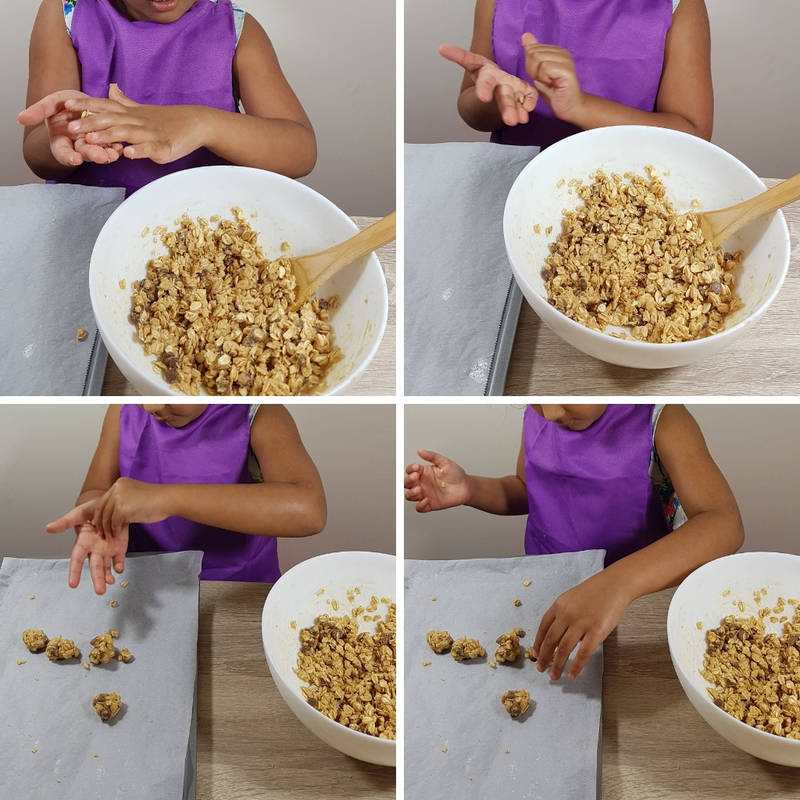 Finally she settled with cookie bites (oatmeal energy balls) as they are perfect after-school treat for her to enjoy. Little chef made Cookie Bites following the recipe in the book with little help and supervision from me. It took just few minutes to make them, Samyu was so desperate and didn’t even want to shape them or wait for them to set, she grabbed a handful of mixture straight from bowl to taste it before rolling them. I saw that she enjoyed the process throughout without any feeling of discomfort. I could see that through the cooking process she picked up the little things that are required to prepare a healthy and quality kid dish. Overall it was a thoroughly enjoyable experience for me and Samyu herself and one that we will be doing more often in the future. This book helped enhance my perspective on kid chefs and I believe it is a must-read for everyone interested in kids cook books and I would highly recommend this cookbook, as I believe it is a good starting point if you are planning to cook with your kids. If you already cook with your kids then this is a perfect cookbook to encourage kid chefs and enrich their experience in the kitchen and create a lasting memories in the side panel of each recipe. These tasty little oatmeal energy balls are packed with fiber, nutrients, healthy fats and a bit of proteins. Truly a guilt free treat for kids with no added sugar. Just stir all the ingredients together, shape them into a ball and chill for 30 minutes. My little chef is a great fan of peanut butter and chocolate combo, however I am sure almond butter or cashew butter would taste good too in this recipe. These little treats are my daughter’s favourite after school snacks along with date bars. Here is the gluten free and vegan energy balls recipe shown by little chef Samyu with process shots and video. In a large bowl, add all the ingredients mentioned above. Now using wooden spoon stir all the ingredients together until well combined. Line the baking sheet with parchment paper. Take small handful of mixture, roll them into small 1 to 2 inch size balls and place them on the baking sheet. Refrigerate the bites for 30 minutes or until solid. Healthy no bake cookie bites are ready to enjoy. Once chilled, store cookie bites in an airtight jar or zip-lock bag. Cookie bites do not need to be refrigerated. Once set, they can be kept at room temperature. You may substitute peanut butter with almond butter or cashew butter. 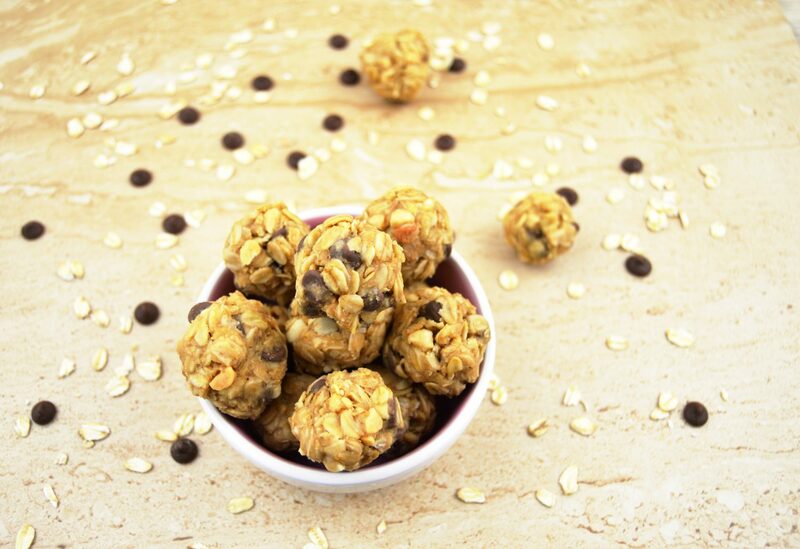 Oatmeal energy balls are quick, simple, make ahead snack perfect after-school treat. These tasty little energy balls are packed with fiber, nutrients, healthy fats and a bit of proteins. Truly a guilt free treat for kids with no added sugar. Just stir all the ingredients together, shape them into a ball and chill for 30 minutes. My little is a great fan of peanut butter and chocolate combo, however I am sure almond butter or cashew butter would taste good too in this recipe. Line the baking sheet with parchment paper. Take small handful of mixture, roll them into small 1 to inch size balls and place them on the baking sheet. Refrigerate the bites for 30 minutes or until solid. Healthy cookie bites are ready to enjoy. My 2- year- olds daughter had so much fun making these ants wouldn’t stop eating them after we were done. Thanks for sharing it on my blog, simplisticmomma.com! What a healthy snack option. Beautifully explained. . Love it . Kids will definitely enjoy making and eating both. Wow….quite nice and innovative! Thanks for sharing. Good that you have provided me and others a healthy snack option to avoid the junk food that we keep indulging in! Oh this is cute! I might try it out! These look amazing! And super easy! I will definitely be giving these a try! Kindly do try. I would love to know how it turned out. Those look so yummy and perfect for the kids to make! Indeed this is the best way to engage them in cooking…. Great recipe I am sure my boys will love there! Thanks for sharing! I am sure your boys will enjoy!!!! I like that your daughter, Samyuktha (Samyu) is a true little chef and you feel that she is a trusty kitchen helper. How wonderful that you cook with your kids: it sounds as though this cookbook is the perfect catalyst! I’m going to make up a batch of these with my youngest: we need exactly this kind of snack around the house now that school has started. Thanks for sharing on #cookblogshare! I am sure the kiddo enjoy making these treats with you Michelle. Happy Cooking. Love your cute little chef and her wonderful cookie. The kids are so talented these days. Fantastic little chef. Thanks a lot Preethi. So true this generation kids are so talented and clever. These are lovely cookies for kids to make by themselves. Tasty and healthy too. Thanks a lot Malini. Such kind words really motivates her to involve in cooking. I loved this book so much. written beautifully and perfect for kids to document their experiences. A must have book for sure. Glad to know you liked the book. wow, such a healthy and delicious snack for kids.Thanks for sharing the recipe. These cookie bites look and sound delicious ……. Really such a great recipe for kids to make by themselves. !!!! Yes Ritu all the recipes are very interesting and amazing images and jokes make the kids engage and enjoy making them. A super easy and super healthy recipe for budding cooks to make; I am sure your daughter loved making these!! She will turn out to be a great chef like you!!! They look so beautiful and tempting; guilt free too! Awesome!! I would love to know how it turned out. Such a healthy and easy recipe for keeping the tiny tots busy and happy, I am sure my son would love to make these will try with him this weekend. So easy and looks like so much fun to do with kids. I am always looking for recipes to engage kids in cooking and this is perfect! I am sure your son would love to make this. Would love to grab some and munch them rite now, how delicious those cookie bites looks. Just prefect to please my sweet cravings. 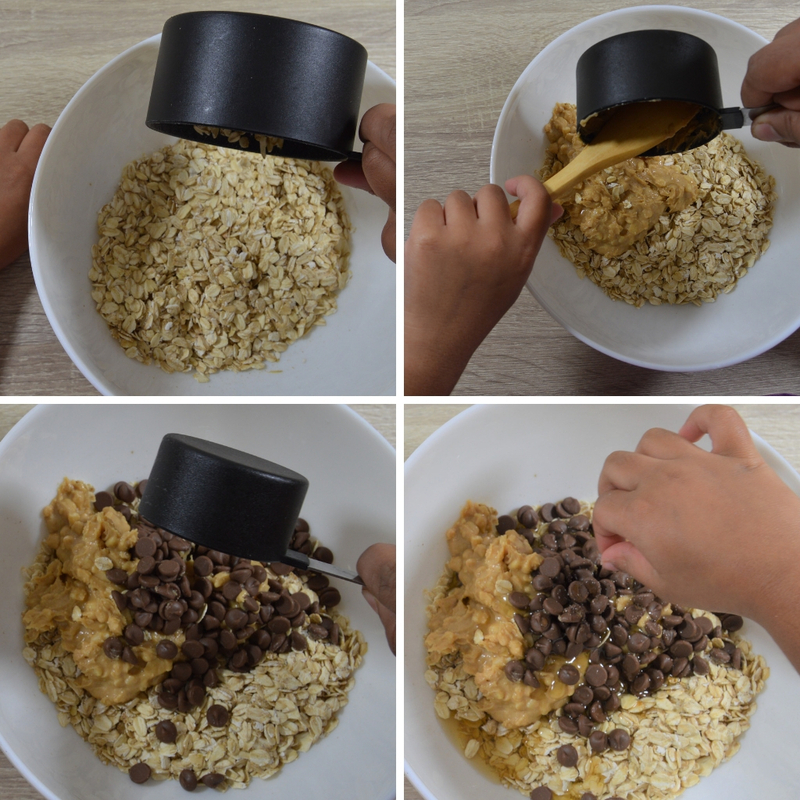 Well done..
My son loves peanut butter and paired with choco chips and oats these no bake bites sound so healthy and i am sure will be treat for him! Perfect snack for all ages and great way to involve kids in fun cooking ! Such a great recipe for kids to make themselves and the cookie bites look and sound delicious too! I don’t have young kids at home but I think that book would make a great present for those who do! Yes, it would be a great present for people with young kids…. My daughter is looking forward to making these for her volleyball snack! Thank you! That’s so good know Nikole. I hope your daughter enjoy making them. Happy Cooking. Stephanie glad to know you and your family members enjoyed these little energy balls. Let alone kids, I would gobble down a couple if had a chance 🙂 Easy and healthy recipe for kids and for them to enjoy making it. Jagruti even I had the same thought in my mind while helping my daughter to make them. I am lucky enough as my little chef offered me even before I asked her. It’s so great to get the kids in to the kitchen early! It really gets them eating the right things if they have a prat of cooking it!